First of all Vitamin B-1 everyday will keep the fea’s and ticks away. It makes them excrete an oder they don’t like but we don’t smell. Get it at any health food store. Removing Ticks from Dogs and From You! Unfortunately, you’ll need to learn how to remove ticks, because try as you might, there will be times when ticks will attach to your dog or onto you, no matter what you’ve done to prevent them. Removing ticks from dogs is a simple procedure. Finding a tick buried beneath all that fur is the hard part! Using tweezers is best, but you can use your fingernails, if you see a tick and do not have a pair of tweezers readily available. Make sure that you first separate and move your Golden’s fur so you can see where the tick’s mouth is embedded. Slide the tweezers so they are on both sides of the tick and grasp the tick against the head where it has bitten in. Apply some pressure while slowly pulling backwards. 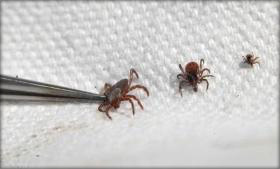 The reason for the slow pulling is to be sure that the tick’s head comes out, rather than breaking off inside, as this will cause an infection. For an already engorged tick, removal will be the same, but it is a little bit harder to get the tweezers at the correct placement. If a tick is on a person, the same procedure can be followed, but we use a match first. Simply light a match and allow it to burn. Then blow it out and gently touch the back of the tick. Sometimes this hot surprise will cause the tick to loosen its bite. Using the tweezers or your fingernails, follow the same procedure as described above. Do not do this on an engorged tick, and do not do this on a dog. You can then put a little bit of peroxide on the site of the bite. Make sure that you kill the tick, as removing it does not kill it.